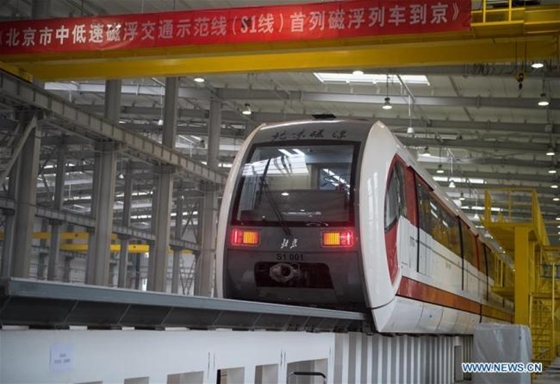 Beijing's first medium-low speed maglev line is expected to start trial operation by the end of this year. The 10.2-km S1 line will connect the western suburban districts of Mentougou and Shijingshan. Eight stations, all elevated, have been built, with a maximum designed train speed of 100 km per hour, said Wang Ping, general manager of Beijing Maglev Corporation. The line is expected to transport 160,000 people every day, with a capacity of around 1,000 passengers per six-car train, said Wang. Using magnetic levitation to move vehicles without touching the ground, a maglev line removes vibration and friction between train wheels and the rail track. The track and electromagnet form a closed magnetic circuit with no magnetic field leaked to the outside. Multiple tests have proved that the electromagnetic fields of the maglev line operation meet the ICNIRP guidelines for electromagnetic field exposure, a widely-accepted standard recommended by World Health Organization, according to the operator. The maglev line will be the first rail transit line in Mentougou District, which will greatly ease traffic congestion on roads connecting the district and the city proper. Shanghai has the world's first commercial maglev system, running between the downtown business district and Pudong airport. The German-made maglev went into operation on Dec. 31, 2002. China's first medium-low speed maglev line started operation in May 2016 in Changsha, Hunan Province, making China one of the first countries to master the technology.